💡 Pro Tip: When choosing your points cost amount, it is recommended that you use the '10% of dollar spend' rule, i.e. your reward discount amount is 10% of the spend required to earn this number of points. 7. Advanced options - Click Advanced Options. Under Terms, add any terms that you want your members to abide by when using this reward. Your new reward will now show on the Rewards page of your loyalty program and is ready for your members to spend points to redeem. Do the loyalty point get removed from the customer's loyalty points balance when they redeem a reward? 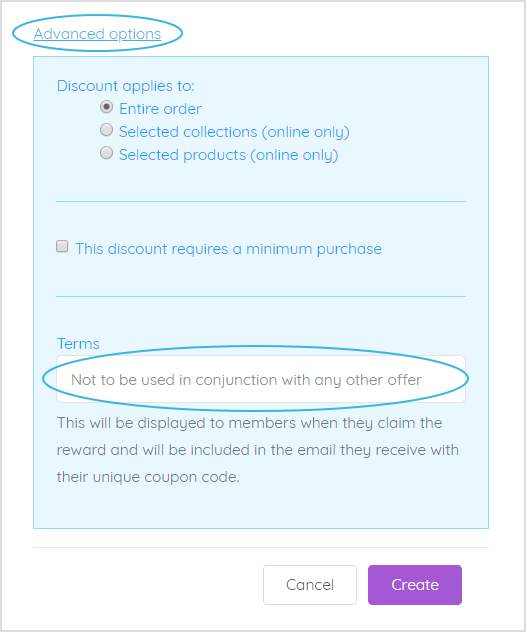 No, reward discount codes are unique and only available for one time use.